This is Part 1 of the Orchard Core and Service Fabric blog series. 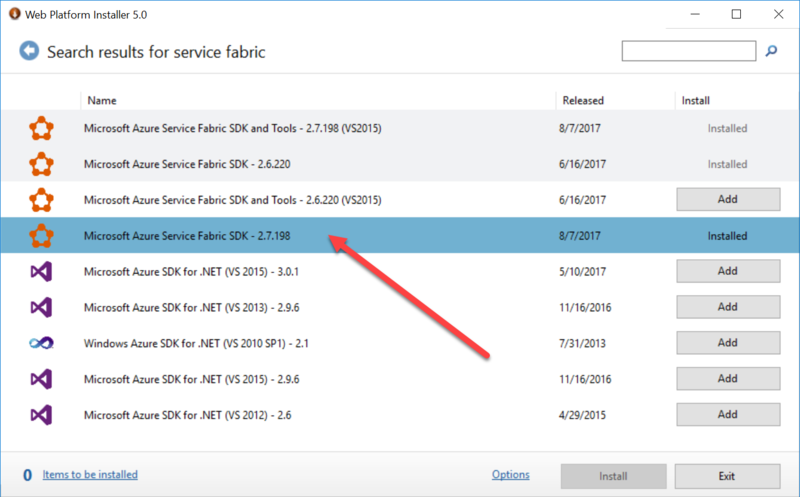 In this part, we'll see how to install Service Fabric and create a new Service Fabric Project using Visual Studio 2017. Before we can host anything on Service Fabric, we first need to make sure we installed it. Service Fabric not only enables us to host applications in the cloud, but also on-premise and on our local machines. Launch Microsoft Web Platform Installer. Search for Service Fabric and install it. There are currently no applications, but that is about to change. Now let's have a look what it takes to create a new Service Fabric Project using Visual Studio 2017. 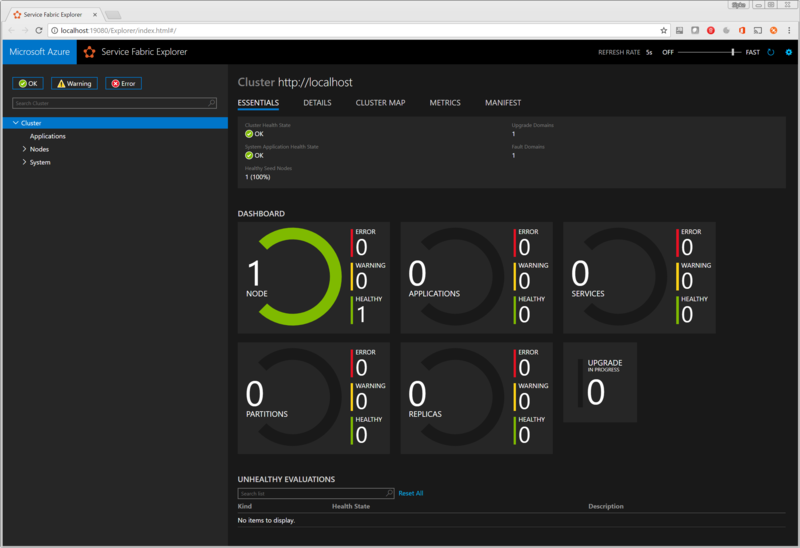 Open Visual Studio, and choose to create a new Service Fabric Application project. You will find this project template in the Visual C# -> Cloud category. Make sure to select the .NET Framework 4.7 as the target framework. As of this writing, Service Fabric does not target .NET Core, but Microsoft is planning to provide support .NET Standard. What this means today is that when you build an Orchard Core application for Service Fabric, it will target .NET Framework 4.7. However, since Service Fabric runs on both Windows and Linux, your application too will run on those operating systems (since they run on Service Fabric). Choose "BooksUnlimited" as the name of the project and solution, and hit the OK button. Before Visual Studio will create the solution, the next screen will ask you to select which type of service you would like to create. 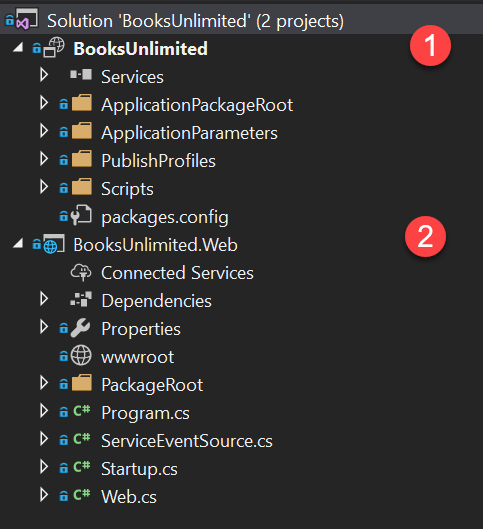 Since we're going to create an Orchard Core application first, we'll go with the Stateless ASP.NET Core template and call the service BooksUnlimited.Web. 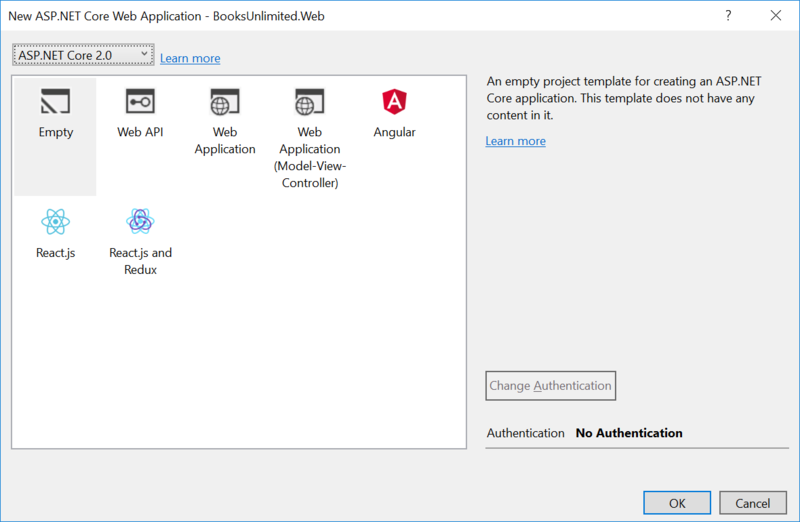 When you click the OK button, Visual Studio will create the Service Fabric project, and then prompt you to select which project template to use for creating the ASP.NET Core Web Application. Make sure to got with the Empty template, as we'll be adding middleware ourselves from scratch. The BooksUnlimited Service Fabric Application project. This project references all services to be deployed as part of the application. At this point, you can run the application using CTRL+F5 or via Debug -> Start Without Debugging. 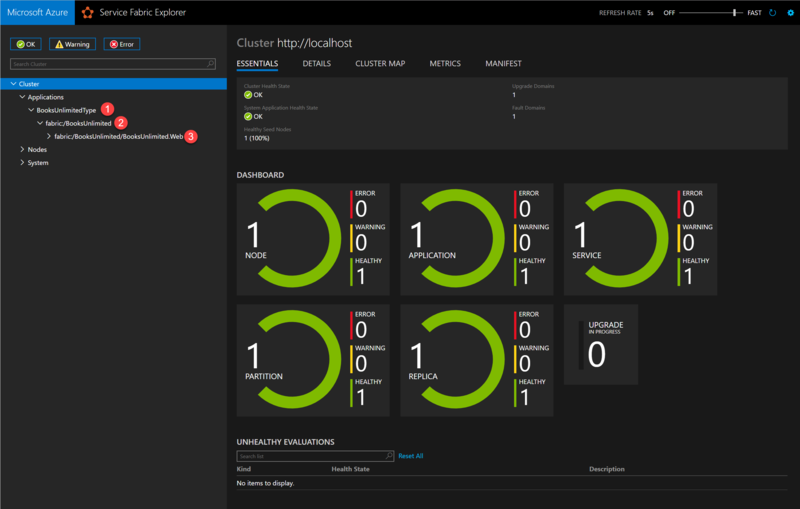 When you do, Visual Studio will deploy the Service Fabric application (BooksUnlimited) to your local cluster. 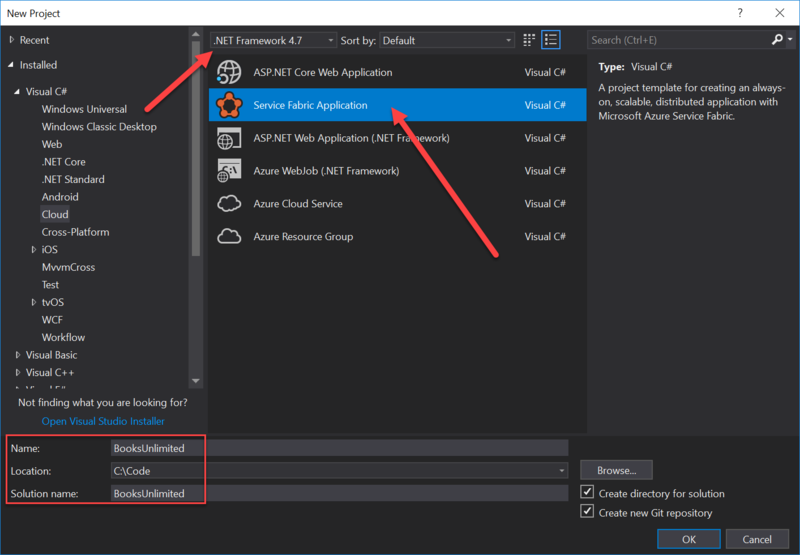 Once deployment is succesful, Service Fabric will try to launch the configured Application URL, which is a random URL that will not necessarily match the URL used when generating the ASP.NET Core project. Therefore, I recommend you sync the two settings to be the same. To do so, we need to know what URL will be used by the BooksUnlimited.Web service to listen for requests. One way to find out is to open the ServiceManifest.xml file in the PackageRoot folder, and taking a note of the port number being used for the "ServiceEndpoint" endpoint. In my case, this is 8303, which means that the desired launch URL should be http://localhost:8303. Now select the BooksUnlimited project from Solution Explorer, hit F4 to open its properties window, and update the Application URL to the desired URL. This is the Service Fabric Application Type, which is by default based on the solution name, suffixed with the word Type. We can have many instances of a given application type. This is one instance of the BooksUnlimitedType application type. This is the one and only SF service we have so far. 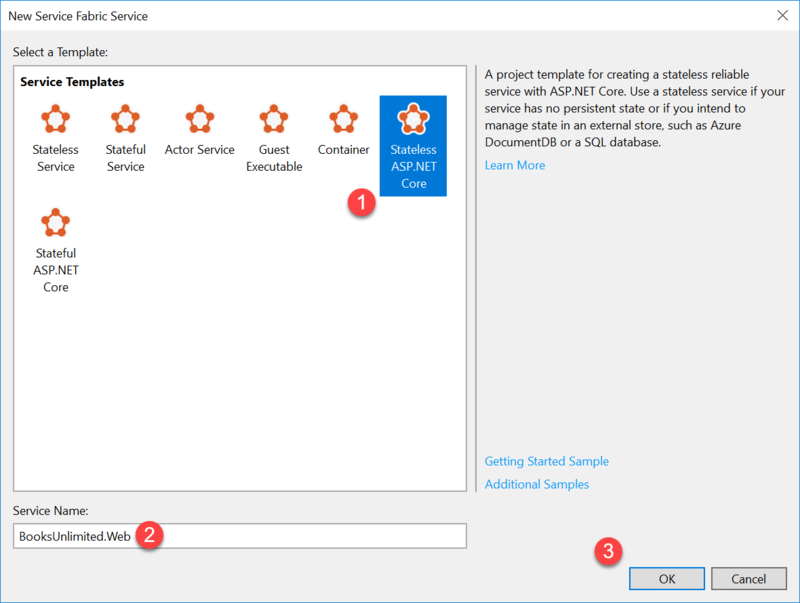 It is a Stateless service that hosts our ASP.NET Core application. Next, we'll see how easy it is to turn our ASP.NET Core application into a full-blown Orchard Core application in Part 2. Email address: Not displayed on the site, used to obtain Gravatar image.